Process Owners absolutely LOVE APQC’s Process Classification Framework (PCF)®. Here are three key reasons why they love it so much – but first – who is a process owner? Process owners are like chief operating officers for tiny slices of an enterprise. Process owner responsibilities vary from organization to organization, but typically include: process definition, system implementation and suitability, tools to bridge gaps, people to execute processes, specific outcomes, and more. 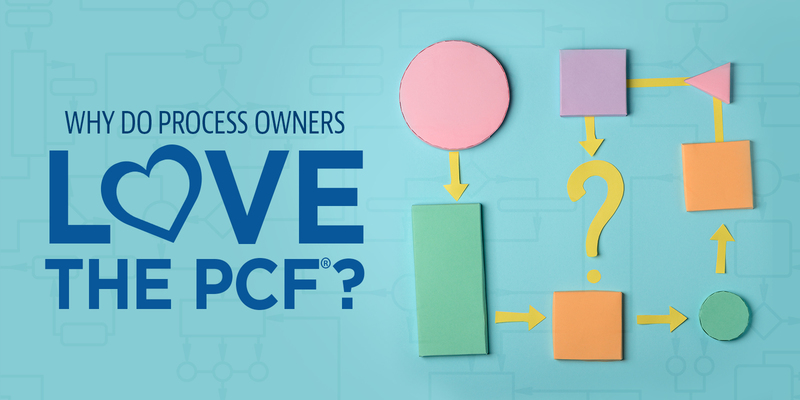 Reason #1: Process Owners save time because the PCF is comprehensive. No other framework represents the breadth of an organization’s operations as well as APQC’s PCF. The PCF defines most process elements in a business, and when I say “defines” I mean that the PCF identifies the process element and explains the purpose of it. As a process owner, part of your job is building process definitions, and in order to do that, the underlying process elements must be defined. Why start from scratch? The PCF gives you access to the broadest collection of defined process elements anywhere! Reason #2: The PCF brings people together. Because the PCF is so comprehensive, it’s easy for people to see themselves and the work they do in it. Process owners have many stakeholders. When each stakeholder can easily see how they fit into the overall big picture, it’s easier to get them focused on the real work at hand and less on the semantics of the situation. This leads process owners and their stakeholders to spend time creating the models that matter – the ones that clearly show how work will get done, how systems will be integrated, how data will flow, and how value will be created. Reason #3: The PCF creates opportunity. Marie Kondo’s tips for organizing the home apply equally to organizing the enterprise: if a tool doesn’t bring joy, should you really use it? The PCF creates joy because it creates opportunity for process owners. When a process owner adopts the PCF, they are immediately gaining access to APQC’s network of more than 5,000 case studies, best practices, and research reports, as well as more than 2 million benchmarking data points. Adopting the PCF for process management creates opportunities for benchmarking, content and knowledge management, and so much more. Finally, process owners love the PCF because it creates a common language. Check out this article on how having a common language creates value for organizations. Or sign up for our next PCF office hours (exclusive to APQC members), where we take questions and discuss some of the many other roles and reasons that the PCF is loved by all of its users.